In our most recent refresh of our acoustic amp chart, we decided to shift a few things around. We replaced the Fender Acoustasonic 150 with the smaller Fender Acoustasonic 40, and added the brilliant Behringer Ultracoustic AT108. While an acoustic guitar may not need an external device to be heard, if you are performing to more than a handful of people in a small room you will require something to boost your sound. Enter, the acoustic guitar amplifier! Whether you are looking for a portable combo amp for coffee shop performing or something with a little more oomph to cope with playing on stage with a band, you’ve come to the right place. We have put together a chart highlighting eight of the best acoustic amps on the market today. Let’s dive in and check out what each one has to offer. The newest iteration of a popular, top-tier acoustic amplifier designed for professionals. 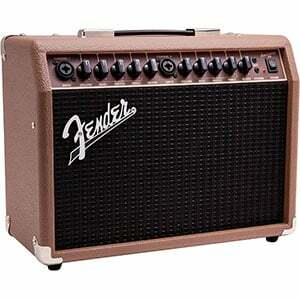 A well balanced midsized amp that brings great core performance and features. Lots of power combined with numerous speakers equals great tone and performance. An unusual, but ultimately great combo that is perfect for music recording. A very lightweight, compact and somewhat unique acoustic amp with enough power. A compact powerhouse from Marshall that delivers a great tone and volume. An affordable Fender combo that does the basic things well. Great performance from this wallet-friendly acoustic amp. 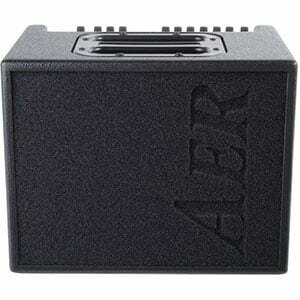 AER Compact 60 has been on the very edge of acoustic amplification for years. The latest version of this awesome box is out and it packs a lot of heat. Right off the bat, you get two individual channels, each with their own EQ clusters. With that said, Channel 1 is a dedicated instrument channel while Channel 2 can be used for both vocals as well as guitars. The best thing about Compact 60 is its transparency. This amp was designed to accurately reproduce the natural tone of your acoustic guitar, which is something it does extremely well. With 60 Watts of available power, you are bound to get more than enough volume even in smaller and medium sized venues. Fishman's long history of making great acoustic guitar preamps has given them a very distinctive insight into the needs of professional acoustic guitar players. They have used all that experience to make some of the most balanced acoustic guitar amps on the market. Fishman Loudbox Artist PRO-LBX-600 is a midsized amp that packs 120 Watts of bi-amped power. Featuring two separate channels, this box gives you a great guitar tone as well as microphone output. The outstanding core performance isn't the full extent of its capabilities. There are also numerous effects and a rather decent expansion suite that allows you to hook it up directly to a mixer. Bang for the buck, this amp dominates its segment of the market. Fender's Acoustic SFX series offer a great bang for the buck to anyone looking to get optimal acoustic tone reproduction. The amp comes with a large number of transducers, including an 8-inch woofer, a 6-inch radiating mid range and an HF tweeter. Thus, all portions of the frequency range are covered with a dedicated set of speakers. Fender's SFX technology pushes the performance of this digital amp one notch further. Using this tech, you can adapt the tone profile of your amp to the room you're playing in. In other words, the output gains a much more natural sounding vibe. Add to that two individual channels as well as five different effects, and you get a complete package. Yamaha's THR series of modeling amplifiers represent some of the most interesting choices for acoustic players as well as those who need a versatile electric guitar tone. The acoustic member of this family, the THR5A brings additional tone options to acoustic guitar players worldwide. It's extremely mobile, comes with built-in speakers and features a wide selection of voices. With that said, THR5A is best used for home or studio recording. Yamaha's VCM technology allows you to get an incredibly natural sounding tone out of a purely digital amplifier. This way you can get a better recording quality while still enjoying the natural sound of your acoustic guitar. On top of that, the selection of effects is definitely worthy of respect. Roland AC-60 is a truly compact package that brings all the benefits of quality acoustic guitar amplification in a mobile format. It brings two channels with some pretty unique features. In terms of power, you're looking at a sensible amount that tops out at 30 Watts in stereo mode. However, Roland has included line outs if you need to expand the setup past its built in 6-1/2 inch speakers. In terms of effects, the selection is somewhat limited, however the ones you do get are pretty well designed. As a matter of fact, their DSP offers a multiband chorus, which you won't find elsewhere. If you need a solid and compact gigging amp, Roland AC-60 is a good choice. The extent of Marshall's amplifiers reaches beyond those legendary Plexis. Their AS50D is among the most refined acoustic guitar amplifiers available at the moment. Marshall has designed this thing to offer decent power while reproducing your guitar's natural tone with utmost accuracy. With two channels available, you can choose to either run an instrument and a vocal, or two instruments. This amp is pretty light and compact, making it a great choice for those who gig often. Even though it only packs 50 Watts of power, it's more than capable of sounding a small-to-medium-sized venue with ease. The gizmo's two 8-inch drivers project pretty naturally over a large distance, allowing you to express yourself to a larger audience. Whether playing solo or accompanying a vocalist, Fender’s Acoustasonic 40 is a very good choice and one that doesn’t break the bank. This lightweight, solid-state combo amp is one of the simpler on this list in terms of features and functions, but it does the basic things very well, delivering a clean and natural tone with 40 watts of power on offer. This makes it ideal for smaller gigs, whether coffee house or church hall. As we mention in the complete Acoustasonic 40 review, one of the highlights is the fact that the two channels (which have combined XLR / 1/4” input for either guitar or mic connections) have separate controls and separate reverb, making it easy to dial in the exact tone you want. One of the cheapest models on this list comes from the respected German brand Behringer, who deliver a compact amp at very wallet-friendly price. With a stylish but rugged combo amp construction, the Ultracoustic AT108 features 20 watts of power delivered through an 8” speaker, offering enough punch for practice and even small performances. The addition of an XLR mic input and its own separate volume control will be an added bonus for performers who sing along to their playing. Although it’s a solid-state amp, the tube simulation offers good clarity and warmth, which can be tweaked thanks to the 3-band EQ. Seriously hard to fault for the price. There’s more on the Behringer Ultracoustic AT108 in the complete review. Now that we’ve seen what’s on offer, let’s help you narrow things down by looking at what to keep an eye out for when shopping around for an acoustic amp. Do you go for a tube or solid-state amp? Both variations exist with acoustic amps and the decision will come down to your budget and tonal desires. Tube amps (which use vacuum tubes to increase the power of a guitar’s signal to the speaker) are the more expensive version, but deliver a thick, organic tone with more dynamic response. Solid-state amps (using silicon-based transistors instead of a tube to boost the signal) are usually cheaper and offer a clean replication of the guitar’s tone. 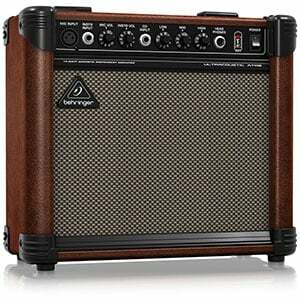 Note that, unlike guitar and bass amplifiers, the standard format for an acoustic amp is a combo. This is the time to define what you are buying an amp for. Is it just practicing in your home? Chances are you won’t need much more than 20 watts of power for this. But as soon as you begin expanding your performances to bigger venues then you’ll need an upgrade in power. While every venue and amplifier are different, around 50 watts of power is ample for most coffee houses, while 100 watts will give you all the output you would need for bigger stages. If you need further power, some amps will allow you to hook up to an external speaker or PA system. Another important consideration is how many channels your amp offers. If you are practicing alone, one channel will usually suffice. But having a second channel allows you to plug in either a second guitar (or ukulele/mandolin) or a microphone for a vocalist, depending on the model. If this is the case, having separate channel controls is essential, allowing you to tweak the volume, tone and reverb levels of both channels. As is the case with electric and bass amps, some acoustic amps also offer built-in effects. The most common are reverb and delay, while you will also find popular effects such as chorus and flange too. Some acoustic amps will also feature an FX loop, allowing you to easily add whatever effects pedals you want. While there are many more acoustic amps on the market, our chart highlights some of the best amps around and has hopefully offered you a little inspiration before you dive into a purchase. Be sure to read some reviews, watch some videos and – if possible – try out some amps before settling on your perfect solution. Good luck! Many people are not even aware of Schertler amps. I own a Schertler Unico Classic and would rate it as the best acoustic amp on the market for my nylon string guitar. I think really serious players end up buying these type of amps and Schertler does not go out of their way to advertise them neither. what about the Rivers Sedona 25-25 watt 1×12″ Acoustic Tube Combo amp? You forgot to mention the Fishman Loudbox Performer 700…the Grandaddy of them all….and under 30 lbs in weight. It’s touted as an acoustic guitar amplifier, but it’s sensational for use with an electric guitar, keyboard, etc. Not to mention a single microphone PA! Try it, you’ll have no regrets. The Schertler amps completely blow away everything on this list. Everything. It’s all connected to what pickup system or your guitar and amp to come together as the perfect sound to your ear . I am amazed that you totally left out the really great sounding Acus amp from Italy. I work ed for 2 years in a music shop and these amps sounding betters th en the boss roland enz…. Tube acoustic amps are hard to find at most on line and brick motar. Why did you leave out the Mesa Boogie Rosette? It is a GREAT acoustic instrument amp, with better eq controls & power, than any of the competition! So the bottom line comes down to just a few things. Portability_is weight and size. Price_can you afford it. Power-can it fill your venu. And tone. Tone is just soo subjective. But blindfolded do you like the way it sounds? So many people are swayed by internet comments, salespeople that are pushing this amp that month and any other hype there is. My suggestion; weather you try it at the store or not, find out if you can get your money back in 30 days, go play the hell out of it at your venues and decide from there only.